Several of the most hotly debated education bills introduced during the recently ended legislative session were related to the funding and expansion of Empowerment Scholarship Accounts. An Empowerment Scholarship Account provides financial assistance from the state general fund to parents who opt to take their qualified K-12 child, who meets certain eligibility requirements, out of Arizona’s public school system and choose other education options. Infographic by Mike Barcia. For a larger image, right click on image and choose open in a new tab. The accounts are funded at 90 percent of the amount that would have gone to the student’s public school. In the three years since the program’s inception, approximately $17 million has been disbursed to ESA accounts, said Jennifer Liewer, public information officer for the the Arizona Department of Education. Parents must waive their child’s rights to a public school education while receiving ESA funds. Empowerment Scholarship Accounts were originally introduced in 2011-12 for students with disabilities – approximately 115,000 eligible students. 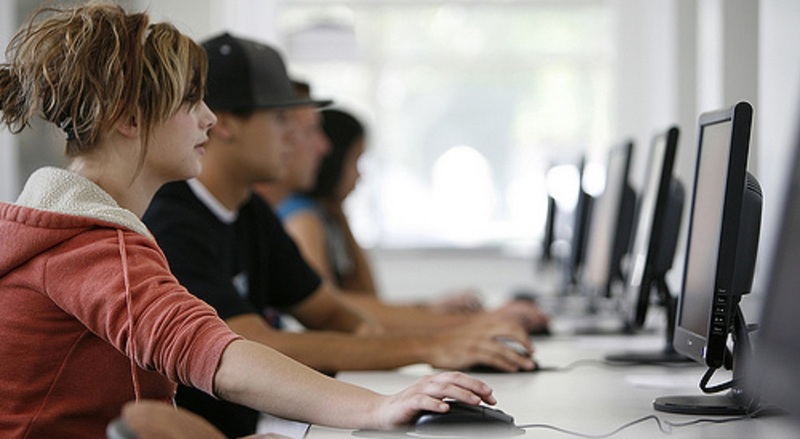 Each year since the Arizona Legislature has expanded coverage to more groups of students. Currently, more than 250,000 Arizona students are eligible to apply. This year, the Arizona Legislature considered a bill which would have expanded ESA eligibility to include all children attending a Title I school, which is a school where a significant number of students come from poor households – about 800,000 of Arizona’s 1.053 million K-12 students. HB 2291 was later amended to include children living in a ZIP code where the median income is 185 percent or less of the federal poverty threshold for a family of four. The bill was later defeated. However, another expansion of the ESA program took place this year as the Arizona Legislature approved and Arizona Gov. Jan Brewer signed HB 2139 into law, making eligible for ESAs the siblings of students who are participating or have participated in ESAs, preschoolers with special needs, and children of military personnel killed in the line of duty. Children of active duty military were added to the program in a 2012-13 expansion. Factors that determine the amount of funding a student will receive include whether the student has special needs, his or her grade level – kindergarten is funded at half the normal level, and whether a student previously attended a district or charter public school. Beginning in the 2014-15 school year, all students in the ESA program will receive funding at the charter school funding level which is currently higher than the district school level, according to a May 2 statement from Arizona Superintendent of Public Instruction John Huppenthal. Arizona Statute 15-185(b)(4) dictates the amounts of charter school funding per student as $1,684.19 for Preschool – 8th grade, and $1,962.90 for 9th grade – 12th grade, so ESA participants will receive 90 percent of that, which is $1,515.77 and $1,766.61 respectively, Liewer said. In the 2011-12 school year, the first year of the program, only special needs students were eligible. That year, 115 students with disabilities used ESAs out of the 115,000 special needs students in Arizona who were eligible. 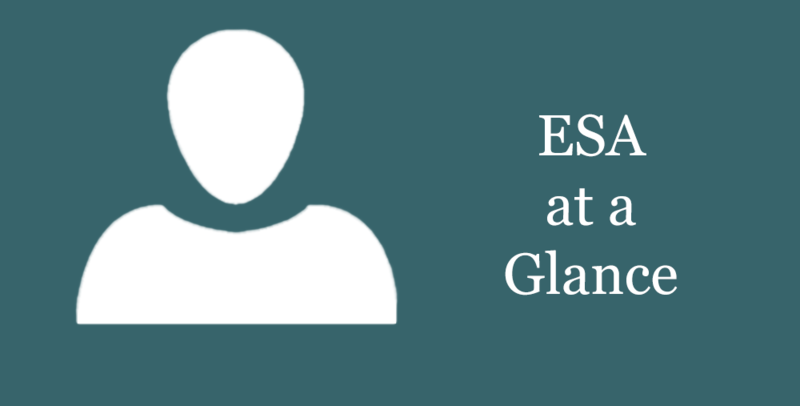 In 2012-13, 302 eligible students used ESAs out of the 225,000 students who were eligible. For 2013-14, the Arizona Legislature approved a law that expanded ESAs to a child entering kindergarten who resides within the boundaries of a public school or district rated “D” or “F” by ADE. 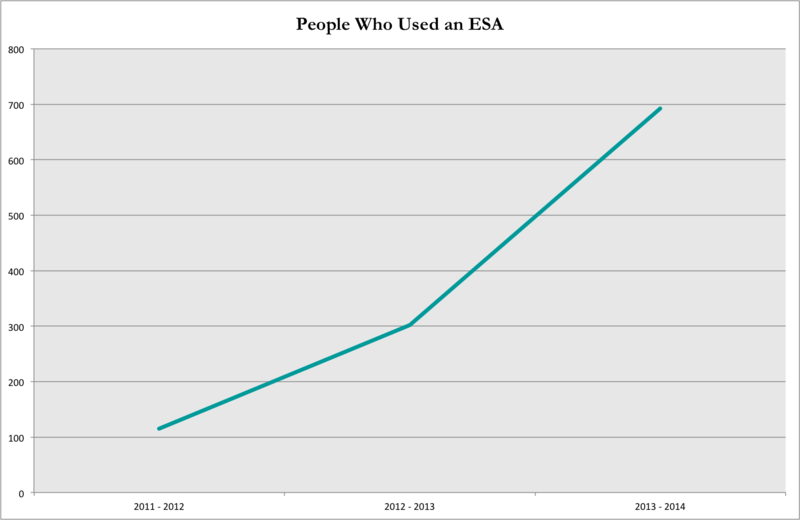 At the start of the 2013-14 school year, 761 students used ESAs out of the 250,000 students eligible for the program, but by March 2014 the number dropped to 692 students, Liewer said. Of those 692 students using ESAs in March 2014, 549 are students with a disability, 92 attend D/F schools, 39 are foster/adopted children and 12 are children of military families, Liewer said. To qualify for an ESA, a student must be an Arizona resident, attend the first 100 days of the school year at an Arizona public school, or receive a school tuition organization scholarship for displaced and disabled students the year prior to applying, or be eligible for kindergarten the year the child would receive a scholarship. ESA enrollment is currently capped at .5 percent of the total enrollment of public schools, Liewer said. The cap will expire in 2020. “This year that cap is about 5,500, but with only 762 people qualifying and signing up for the program, we are not near the cap, nor do we expect to reach it,” Liewer said. Applications for the ESA program for the 2014-15 school year, which were due April 1, doubled to 2,479 from 1,100 applications in 2013-14, Liewer said. The Arizona Department of Education said the number of applications for the first two years of the program was not available. Applications increased after a $250,000 marketing campaign by the Arizona Alliance for School Choice, a non-profit which advocates expansion of school choice, which included automated calls from Arizona Superintendent of Public Instruction John Huppenthal talking about the ESA program in February 2014. ESA money must be used to provide an education that includes, at a minimum, reading, grammar, mathematics, social studies, and science, according to the Arizona Department of Education. Additional eligible expenses for children with special needs are educational therapies or services from a licensed or accredited practitioner/provider and services/aide from a licensed or accredited paraprofessional. In 2011-12, the 115 students who used ESAs spent $1.4 million with $740,000, or 52.8 percent, going to private schools, $98,000, or 7 percent, to therapy, $29,000, or 2 percent, to tutors, $12,000, or .8 percent, to curriculum and $278, or .019 percent, to online programs, according to the Arizona Department of Education. In 2012-13, the 302 students using ESAs spent $5.2 million with $3.386 million, or 65 percent, going to private schools, $271,000, or 5 percent, to therapy, $255,000, or 4.9 percent, to tutors, $97,000, or 1.86 percent, to curriculum, and $3,700, or .07 percent, to online programs, according to the Arizona Department of Education. 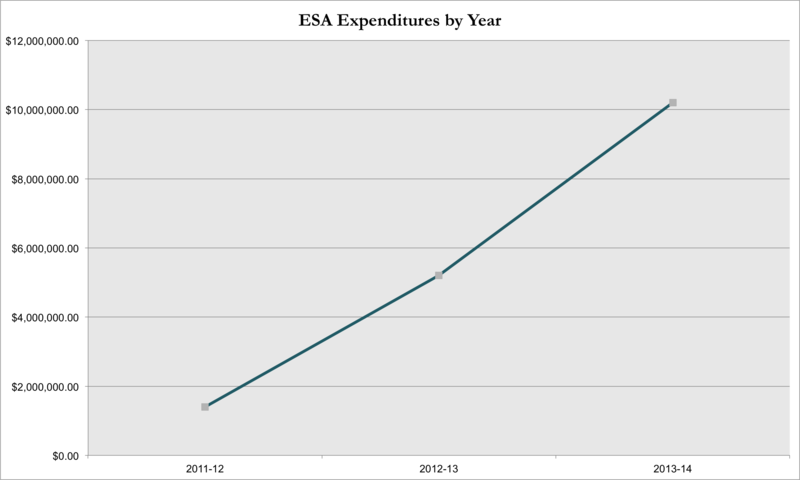 About 26 percent of ESA money disbursed was unspent in 2012-13, according to the Friedman Foundation report. The Arizona Department of Education was asked several times for a total amount of ESA funds disbursed for 2013-14, how much was spent so far, and a break down on what the ESA money was spent on, but the agency did not provide that amount. Program participants receive their funding quarterly, after the previous quarters expenses have been audited and approved. The fourth quarter disbursement went out last week, but Liewer said ADE will not have final numbers for the year until the auditing of fourth quarter expense sheets has been completed this summer. The department had projected to spend $10.2 million for ESAs in the 2013-14 school year when the school year began last fall, Liewer said. Two ESA program participants have been referred to the attorney general’s office for criminal investigation for misuse of the program, Liewer said. 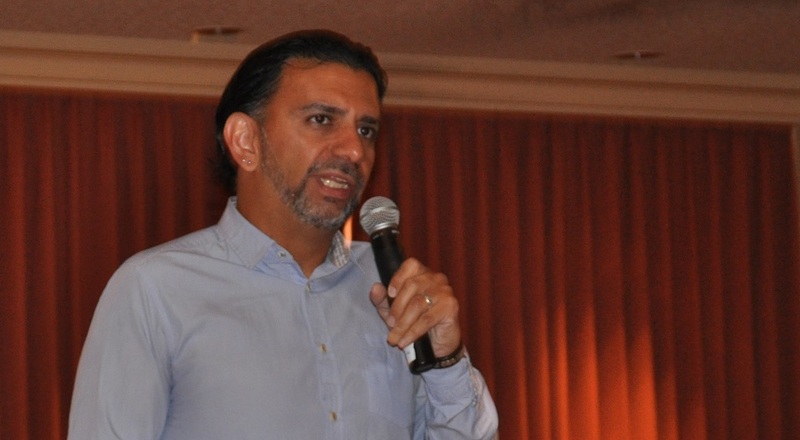 Because of FERPA laws, these files are confidential and release of individual information about students, where they attend school and individual spending is prohibited by Federal Law, Liewer said. “The electronic aggregation and computation of very specific data sets is cumbersome and time consuming and outside of how the case management system operates,” Liewer said.